Dave Mosher/Business InsiderSpaceX’s Falcon Heavy rocket stands ready for launch on February 5, 2018. The rocket is vertical on the launchpad at the Kennedy Space Center in Florida and being readied for launch. CAPE CANAVERAL, Fla. – This week, after years of delay, SpaceX founder and tech mogul Elon Musk hopes to finally launch Falcon Heavy: the most powerful operational rocket in the world. Musk originally planned to raise the 230-foot-tall, three-booster launcher in December 2012, then launch it on a maiden flight sometime in 2013. 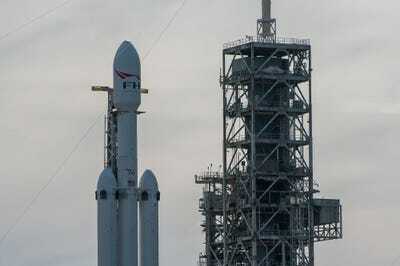 However, it took SpaceX until December 2017 to raise Falcon Heavy into launch position for the first time. The company successfully test-fired the rocket’s 27 Merlin engines in January, clearing the way for a maiden launch that’s currently scheduled for Tuesday. Dave Mosher/Business InsiderThe base of SpaceX’s 230-foot-tall Falcon Heavy rocket stands next to its vertical stand and the scaffolding of Launch Complex 39A. Following a series of liquid fuelling tests and a successful test-firing, SpaceX once again set its behemoth rocket on a horizontal carrier, wheeled it out of a nearby hangar, and inched it upward onto a launch pad at the Kennedy Space Center. This time, barring any technical glitches or weather delays, Falcon Heavy will fly Musk’s own Tesla Roadster toward Mars orbit. Or perhaps it will explode into countless pieces. SpaceX received a Federal Aviation Administration permit to launch Musk’s electric car on Friday, which we first learned about via NASA Watch. The rocket should lift off shortly after 1:30 p.m. ET tomorrow though perhaps as late as 4:30 p.m. – that is, if thick cloud cover, strong winds, technical glitches, or other issues don’t delay the launch. If SpaceX delays the launch, the company is likely to try again Wednesday during the same time window. 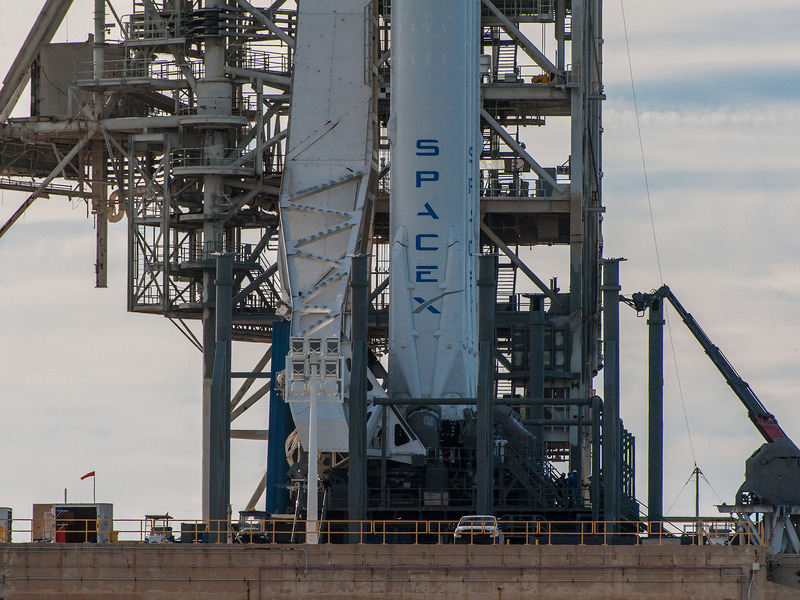 You can bookmark this post to watch SpaceX’s live webcast on the day of launch. Dave Mosher/Business InsiderInside the top of SpaceX’s Falcon Heavy rocket is Elon Musk’s midnight cherry red Tesla Roadster electric car. SpaceX builds its rocket parts in a few locations, partly assembles them, then ships the sections to a launch pad for final assembly and integration with a payload. With the company’s Falcon 9 and Falcon Heavy rockets, this integration process happens in a horizontal hangar near a launch pad. Then the rocket is wheeled out shortly before launch. 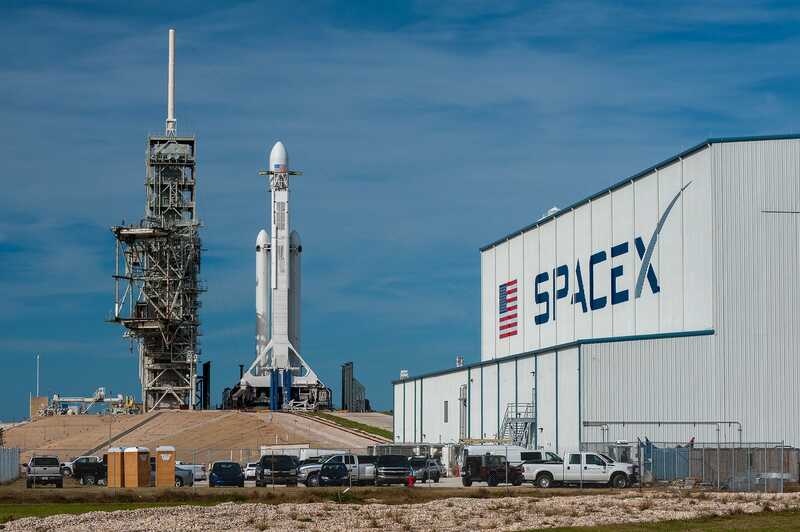 On Monday, Business Insider visited Launch Complex 39A, the historic launch pad where Falcon Heavy was recently taken vertical. This is the same location that NASA used to launch Apollo astronauts to the moon on Saturn V rockets, the most powerful rockets ever successfully launched. Dave Mosher/Business InsiderThe scale of SpaceX’s Falcon Heavy rocket at Launch Complex 39A on February 5, 2018. Musk hopes to continue the tradition of visiting the moon with Falcon Heavy, starting with a private lunar voyage for two as-yet-unnamed citizens, likely in 2019 at the earliest. 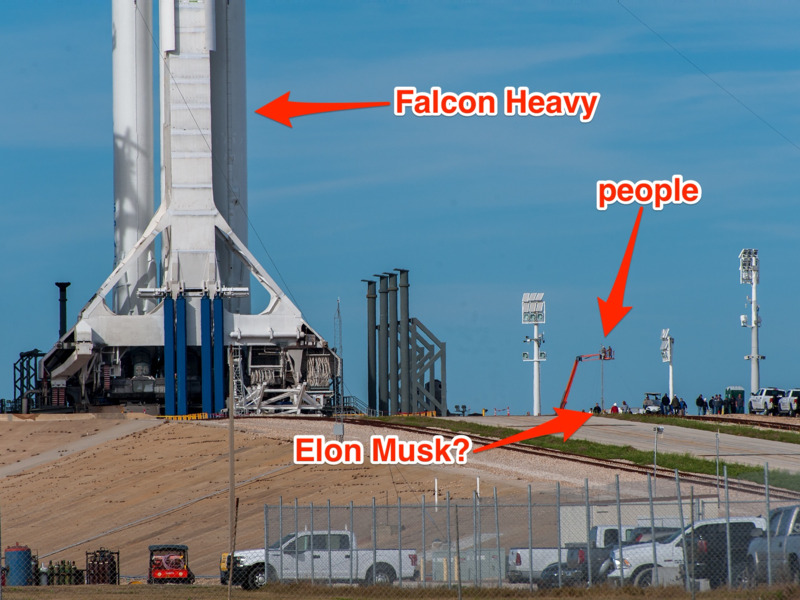 The SpaceX CEO and lead designer was seen touring the launch pad and staring up at the rocket during our trip, though at a distance too far to clearly discern. Musk and his gaggle of SpaceX employees making final preparations for the 23-story machine’s debut gave it a jaw-dropping sense of scale – and the stakes involved.